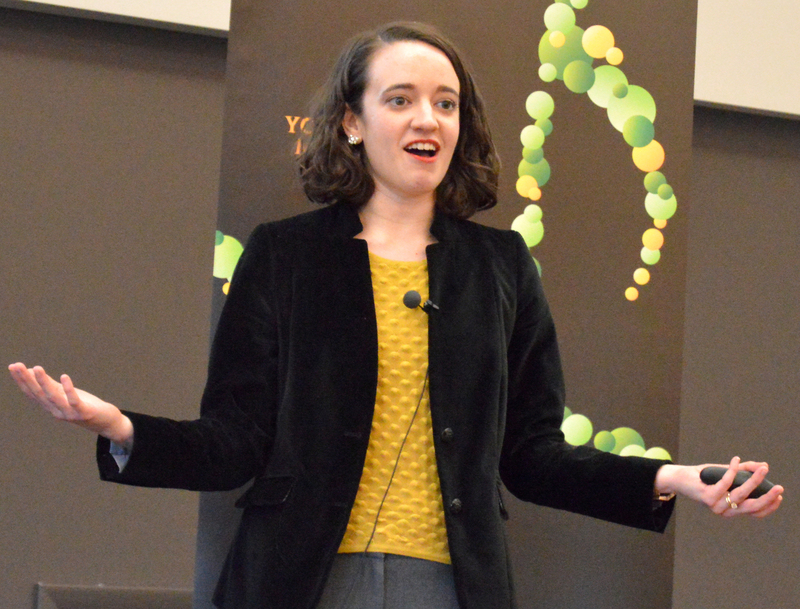 The University of Illinois College of Medicine at Peoria and Youth Music Illinois teamed up recently to host the second annual Music and Mindfulness in Medicine Symposium. “Music is everywhere, and it’s ingrained into our way of thinking and behaving. It’s a part of our interactions with others, our community, and our identity. We can’t escape music, nor should we, and knowing that, the question really becomes: how can I use music to better myself and those around me?” said A.J. Heaps, a second-year medical student at UICOMP who led the two-hour symposium at the Life Together Center in Peoria. 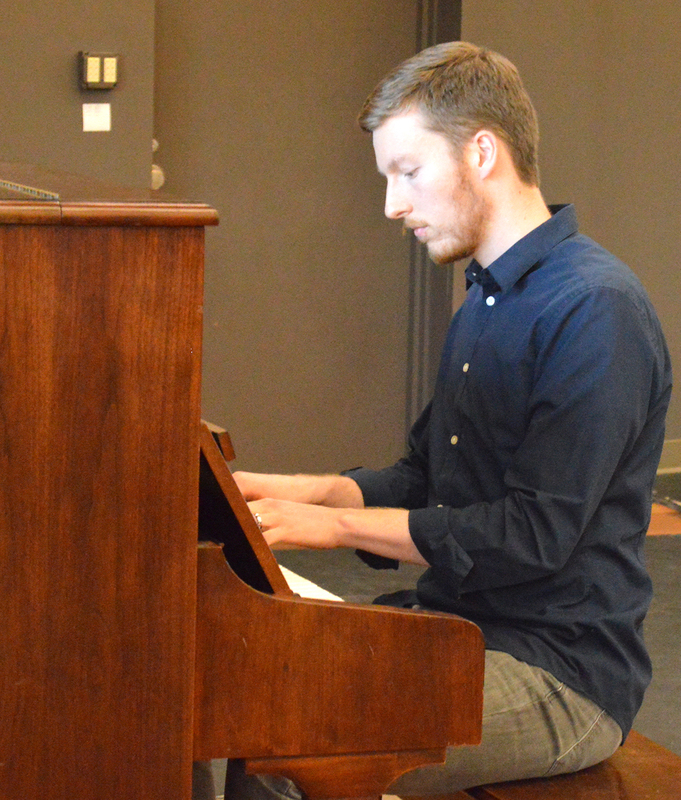 The idea for the event originated last year with Jeffery Brown, a current third-year medical student and Julliard graduate, who wanted to explore the neurological effects of music. The first symposium featured a panel of neuroscientists and physicians, as well as live EKG readings of audience members taken as the Peoria Symphony Orchestra performed pieces by Mozart and Rachmaninoff. “I took the torch of directing this year’s symposium as Jeffery wished to focus his time and attention on his medical studies,” said Heaps, a Utah native and competitive ballroom dancer who has competed in U.S. and world championships. 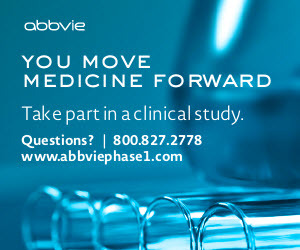 Heaps decided to shift away from educating physicians this year and focus instead on educating the community. “These ideas of music and wellness are topics bounced around the professional realms but are topics that could benefit anyone if they just knew more about them,” he explained. 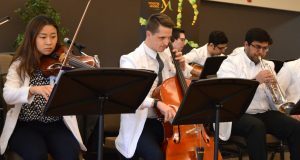 Musicians in Medicine, a performance group of UICOMP medical students that was founded last October, kicked off the program with three songs while Heaps asked the crowd of 50 to 75 to think about feelings and emotions the music evoked in them. The first speaker, an assistant professor in the department of psychological sciences at Missouri University of Science and Technology who has a doctorate in neuroscience, discussed her research on music, emotion and memory. “I do research in music cognition. We can use music to study social behavior, attention, perception, language. All these different aspects psychologists are interested in studying about the human condition, we can study through music,” said Amy Belfi, whose lab employs a variety of techniques, including functional neuroimaging, psychophysiology and neuropsychological studies of patient populations. Among the findings of her research are that music-evoked memories are more vivid than memories evoked by other stimuli and that most people who suffer severe brain damage still report an enjoyment of music. Belfi said there is a very small percentage of the population that has musical anhedonia, which means they don’t like listening to music at all. She added that most people intuitively use music to regulate their emotions. The second speaker, a masters intern in music therapy, agreed with that but asked the crowd to be more mindful of that and use it to their advantage. Mac Christensen, who holds a bachelor’s in piano performance from Brigham Young University and has done clinical work at Mayo Clinic Hospital, encouraged the group to use music for relaxation after demonstrating the technique of progressively acknowledging tension in the body from head to toe and then letting it go while listening to quiet music. He also touted the benefits of singing, either in a group or alone in the shower or while driving. “Singing is beneficial both physiologically and psychologically. It encourages deep breathing and breath control,” Christensen said. Heaps said the symposium will continue next year. “Hopefully you can a little better appreciate how we process music and how you can use it in your life to be a little bit healthier and make positive changes moving forward,” he told the crowd.